On what proved to be a most interesting evening, we had the second Flamsteed “History of Astronomy” group meeting, with Flamsteed member Mirek Colakov talking about the Armillary Sphere which he constructed himself to demonstrate how the instrument can be used. Mirek is an experienced yachtsman and has a deep interest in celestial navigation and the history of navigational instruments. 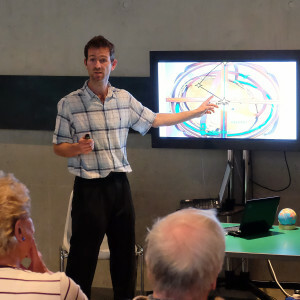 His extraordinary knowledge of instrumentation and navigation had the audience enthralled throughout and everyone was fascinated by the Armillary Sphere and the small globes which he brought along to demonstrate navigation techniques. Of particular interest was his demonstration on how to find where the Sun was at any point on the Earth at any time, just using a globe and a compass. Mirek believes that astronomy is a very nautical science, which must explain his affection for the Royal Observatory, and is very keen on explaining the basics of celestial mechanics, an art that he believes is starting to die out due to our reliance on gadgets and computer software. There is no doubt that he inspired many of those present to find out more about this fascinating topic. Our thanks to Mirek for a very entertaining talk, which was a fitting addition to our History of Astronomy programme.